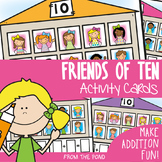 Friends of Ten Scoot: Freebie! Scoot is a fun, engaging, active game that kids love again and again. 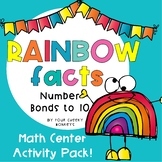 This freebie contains 1 scoot game to practice, reinforce or even assess combinations of 10 - such an important skill in first grade! Recording sheet also included. 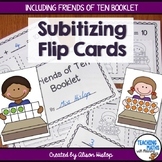 **This freebie used to contain 4 variations on the scoot game. 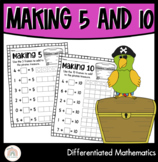 This pirate themed worksheet will help your class consolidate their understanding of making 10 and making 5 using frames. 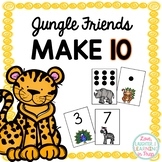 I use this with coins and little treasure chests and my kids love it! 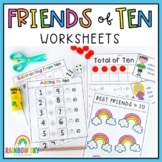 The Friends of Ten Poster Maker is a great display for you to make for your classroom. 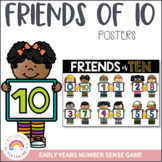 The poster contains a face, two hands, a Friends of Ten title card, and number cards to match the "friends of ten". 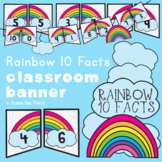 Assemble everything onto an 18 x 12 piece of construction paper and display in your classroom.